Customers expect to interact with companies through each and every channel they use. Brands not only must support all of the touch points that customers use, they also must provide seamless, integrated cross-channel experiences. For instance, let’s say a customer is visiting a website for a cycling retailer and is having difficulty finding hydration accessories. If the customer chooses a click-to-chat option for assistance, the agent she is connected with should instantly see the customer’s most recent web activity just prior to their interaction, enabling the agent to provide relevant and immediate support. Unfortunately, most companies lack these capabilities. Channel silos, governance and organizational structure often prevent agents from obtaining a 360-degree view of customers, including their cross-channel behaviors, product ownership and customer value. The stakes for providing customers with exceptional experiences are higher than ever. According to the 2015 inContact Consumer Research Study conducted with Harris Interactive, 86% of consumers would be very likely to switch to another company in the future after a bad customer experience. 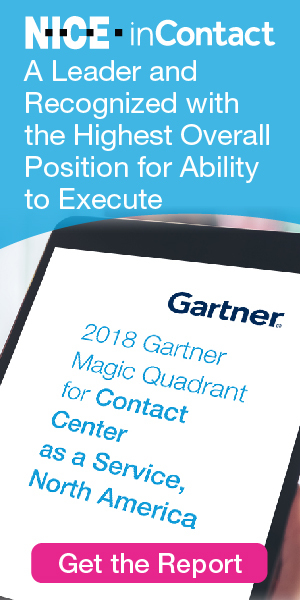 One effective way for companies to address disconnected customer experiences is by implementing a cloud contact center that synthesizes the full range of a customer’s omnichannel interactions across all support channels as well as CRM data and other vital customer information retained by a company. Cloud contact centers can provide contact center supervisors and agents with a single, integrated view of a customer’s transactional and behavioral history, thus arming decision-makers with the intelligence needed to provide each customer with personalized and contextual support. Contact centers need to be able to move at the speed of customers. The use of workforce analytics can be used to identify the types of issues customers are trying to resolve in different channels in real-time and then route customers to those agents who have relevant skills and experience to assist them. For example, let’s say a customer is using the website for a health services company to find information about in-network orthopedists. If the customer needs to speak to an agent for additional information, the information that’s shared during his web interaction can quickly be analyzed and then used to connect him with an agent who is particularly skilled at matching customers with in-network physicians. Contact center supervisors can also benefit from the use of analytics. Workforce analytics can help organizational leaders determine peak periods for inbound calls or requests for chat, email and other types of digital support and then use these insights to direct resource allocation and scheduling. State-of-the-art technologies can enable contact centers to operate faster and more knowledgeably in order to provide customers with the rapid and contextual experiences they expect.